When we send too many datas to Flexmonster, we get an error, see attached. I have 2 questions, how can we catch this error and show to the user a friendly message ? and do you know how many datas we are able to send to Flexmonster ? Thank you for writing. The error from the screenshot is 504 Gate timeout error. Such type of error says that the server was not able to return the response in time. Usually, it happens when the server receives too many requests and the server is not able to handle them all. After that, the server sends a webpage with 504 error as a response. You can see it in the details of the error. Such type of errors should be handled on the server side. We recommend you to configure the server response and respond with a friendly message to a user. Also please note, that Flexmonster does not have any limitations on the number of data. Let us know in case of any other questions. when you write “Usually, it happens when the server receives too many requests and the server is not able to handle them all” which server do you mean, yours or ours ? Thank you for your feedback. Please note that Flexmonster is a client-side application which runs on client’s browser. Therefore, it is only about your server from which Flexmonster loads the data. As for the best practices for loading the data, everything depends on your data source. In case you are using SQL database, we recommend trying our Flexmonster Data Compressor to get a better performance: https://www.flexmonster.com/doc/connecting-to-relational-database/ . Do you know if there is a way to check the reason behind the dataerror ? We’d like to trigger our custom alert only on a 504 responde code. We are glad you’ve customized the alert to suit your needs. As about a way to check the reason behind the dataerror, we can add the following improvement: the error message from the response can be passed to dataerror event. You can see the content of such message on the screenshot you provided us with at the beginning of this thread (the error message is shown after 'Details:'). 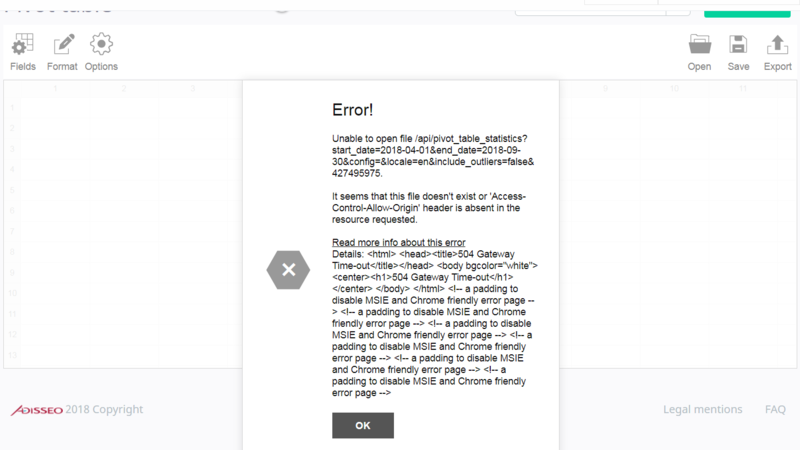 The access to this error message inside dataerror would allow further customizing of the alert. Would such improvement work for you? Please keep in mind that our component would have access to such messages only in case they are returned from your server-side (as on the screenshot). Thanks for proposition, yes it would be a nice improvement for us. Thank you for your feedback. Our dev team will add the update to the nearest minor release ETA Nov05. We are glad to inform you that the latest version of the component is already available on our website. You are welcome to try the update for the dataerror event.